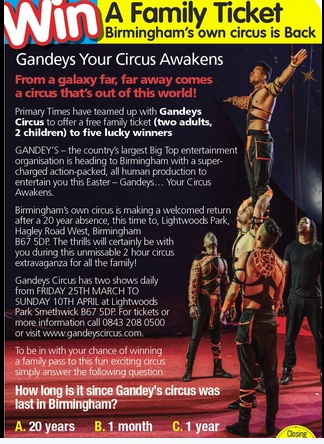 Gandey’s Circus comes to Bearwood…..at Lightwood’s Park in March and April 2016……be there….!!!! …and don’t blame me if they don’t know that Lightwoods Park isn’t in Birmingham. Its International Women’s Day 2016 and across the world there are events to mark this day online and at venues. Multi award-winning musical Mary Poppins flies back onto the Birmingham Hippodrome stage just in time for Easter 2016, opening on Wednesday 9 March until Saturday 23 April 2016.